Salvador is known for its natural wonders, welcoming people and deeply-rooted African cultural influences. The rhythm of Capoeira – a Brazilian dance-like martial art, the aromas and flavors of local delicacies, such as the Acarajé, the religious syncretism and cultural melting pot are only a few samples of the joie-de-vivre of a people surrounded by natural beauty and who really understand the meaning of the word “alive”. The city is also home of one of the liveliest and most popular Carnaval festivities in the country. Brazil’s first capital, Salvador also has an important historical center, recognized as a UNESCO World Heritage Site: the Pelourinho, featuring Brazilian Baroque churches and age-old mansions. There are over 300 churches in Salvador. One of them is the São Francisco Church, which stands out for its grandeur. Another important city landmark is the Senhor do Bonfim Church, one of the most important symbols of Bahia’s religious syncretism. In Salvador, Catholicism coexists with African religions, bringing together Iemanjá and Our Lady of Conception, Iansã and Saint Barbara, Nosso Senhor do Bom Fim and Oxalá. The African culture is also seen in the music and dancing, such as in the art of Capoeira. Salvador is also a great starting point for those looking for adventure in the Costa dos Coqueiros, Costa do Dendê or Chapada Diamantina. Brazilian cuisine is marvelous. 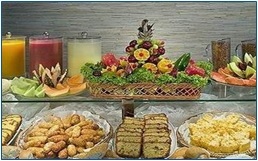 But Bahia’s cuisine is incomparable. Unique fruits and spices are found there. Get ready for exquisite juices and sauces. African ingredients are also very popular in the cuisine, such as palm oil, coconut milk, ginger, and pepper. 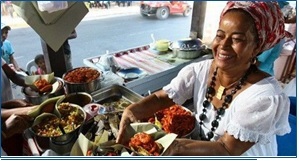 Acarajé, caruru, and vatapá are world-famous typical dishes, served in local Bahia trays.